Getting Paid to Buy Buffett? In Tuesday’s The Rich Investor, I once again spoke about the merits of put-option selling, and how you could use it to receive immediate cash in exchange for your agreement to buy a stock of your choice at a price of your choice. We looked at an example using the SPY exchange-traded-fund. But today, I’m going to show you an ingenious way to get paid to piggyback one of the greatest investing legends of all time – Warren Buffett. Currently, Buffett is worth north of $80 billion. He’s had decades of success running his Berkshire Hathaway holding company. In fact, he’s part of a very select group of the world’s richest people. Click here to see a real-time list of some of these lucky folks. Maybe, if we all could invest like Uncle Warren, we could join him on that list. Lucky for us, his holdings aren’t a secret, and we can even buy the same investments. Click here for Berkshire’s current portfolio. The good thing is that, as investors, we don’t need to go out and buy every single stock in that list. That’s because we can invest in either the Berkshire Hathaway Class A shares (NYSE: BRK-A) or the Class B shares (NYSE: BRK-B), which hold all the same investments. Considering the Class A shares cost a whopping $297,000 each (as of 10 a.m. on Wednesday), us mortals can stick with the Class B shares which trade for a more palatable $196.63 per share. Looking at the chart, let’s assume you want to buy 100 shares of BRK-B, but not at $196.63. 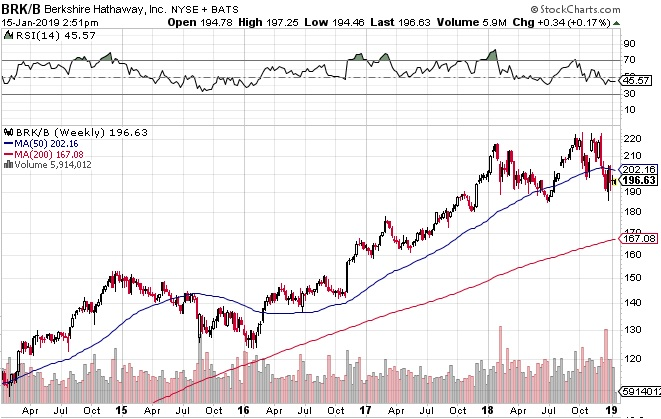 You want a bargain and would be happy with a purchase price near the five-year low of $120 per share. That would represent a $76.63 per share discount to its current price, equaling a 39% drop. Obviously, no one will sell you shares at $120 if they can currently get $196 for them. So, it becomes a waiting game. Will BRK-B ever fall back to $120? Who knows. But in the meantime, we can squeeze some cash out of the market by selling put options on BRK-B. 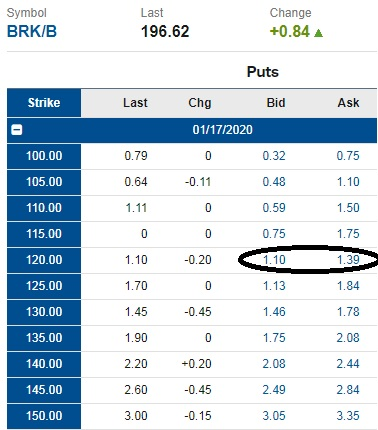 Above is the sampling of BRK-B put options that expire in January 2020. Since $120 is the target buy price, we can sell the $120 “strike” puts for a fair value of $1.25 per contract (splitting the bid/ask). With the 100-share multiplier (each option contract represents 100 shares of stock), an immediate $125 would be deposited into our trading account. The strike price represents the level in which we would exchange shares of the stock at some point in the future. In this example, that’s January 2020. We’re being paid today in exchange for our agreement to potentially buy the shares. I say “potentially,” because it’s not a guarantee that it’ll come to fruition. What is a guarantee is that we always receive the upfront cash. If potentially buying 100 shares is your goal, you could sell one contract. If you’re willing to purchase 500 shares, you could sell five option contracts and receive an immediate $625. The outlay of cash if the trade comes to fruition is $12,000 to buy each 100-share block; 500 shares would require an outlay of $60,000. Will I Get to Buy the Shares? That depends on whether BRK-B falls to $120 in the next year. 1. If BRK-B closes below $120 on expiration day, then mission accomplished. You will follow through on your agreement and buy the 100 shares. This will require full payment of $12,000. Plus, you keep the $125. The only way you would be able to buy the shares at your desired price of $120 is if BRK-B actually falls (and stays below) that level by January. 2. If BRK-B closes above $120 (the more likely outcome) at expiration, your contract will expire and no shares will change hands. You still keep the $125. At this point, you can repeat the process by selling a new put option (establishing a new buy level), and receiving a fresh influx of upfront cash to your account. 1. To sell put options, you will need an approved options-trading account with margin capabilities. Talk with your broker about it. 2. There’s no free lunch. After selling the put option, you will be required to keep some of your account funds on hold. It’s collateral to keep you honest. Most brokers will typically place 20% of the full purchase cost of the stock on hold. For instance, to buy the 100 shares at $120 per would cost $12,000 at expiration. Until that day comes, your broker will hold 20% of that, or $2,400, aside. Even though you’ll have funds on hold, you still would receive the $125 upfront payment. 3. Stocks can move lower than you think. Even if you’re lucky enough to buy the shares at $120, what’s stopping BRK-B from going lower? Nothing. Make sure you have a stop-loss order in place. 4. Option trades can be offset at any time. If you no longer feel comfortable in the trade, you can easily close it out. Depending on BRK-B’s price at that time, the option trade will produce either a gain or loss. Here’s to your future put-selling success!